If you have more than one child, you already know what Tug-of-war between the heart and mind feels like. Every girl promises herself that she’d be a fair parent whenever she becomes a Mom. It gets a lot more crucial, because Moms are the nucleus of their families and the undeniably most loved ones for the kids. Being fair seems justified till the kids are toddlers. Once they have a sensibility and decision making capacity of their own. Thereafter they get to decide, think and be all the more messy. But the reality is, that no matter how hard you try, the guilt of not being able to be fair bites every parents’ heart. 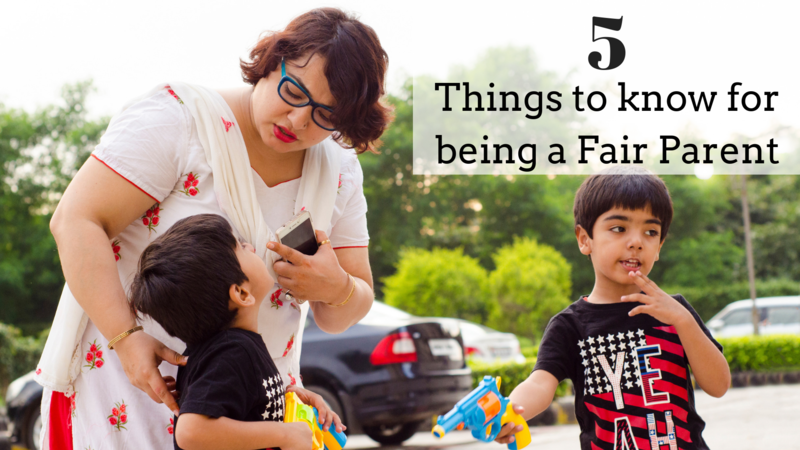 But with some reality checks, we will talk about 5 Ways of being a fair parent. What does being Fair Mean? Well, in the first place, just ask yourself what being fair means to you. Does it mean going halfsies on everything you buy for them? Or always buying two of the same thing? But being fair is a lot more than that. With more than one child, more than one personalities come in to the mix. To tell you the reality, no matter what – You cannot always be fair to your children. Period. You can always attempt to be, but there will be situations, frequent situations, that will make you hold back your emotions and guilt and take a step. that step, usually, is what makes you an unfair parent. Let’s say one of your children has a cold, and you had promised that they could have ice cream on Saturday, what would be a fair decision? Not buy ice-cream for the one who really wanted to have it, but can’t because he has a cold? Or buy ice cream and fulfill your promise, irrespective of your boy’s cold. A lot of time negotiations, logic and explanations work. But as parenting has taught us so far, it is one day at a time. You never know when it works and when it does not! It is possible that you are able to convince the one with a cold to buy something else, or may be the other one to not have an ice-cream either. But we all understand that it is possible to totally upset both kids and throw your sanity and willingness to be a fair parent right out of the window. Show us some love on Pinterest. Find the pinnable Image Below. Those days, just go with the flow and try to fix the issue with whatever it takes – a risk or a tantrum. You may need to convince the less aggressive one to take an alternative option, or bribe them with what works better than ice cream for them. But eventually, your needs of being Fair will not be met that day. Those days you will have to deal with the fact that being fair is not always possible, at least for humans. One of the main reasons of children not feeling that you are fair, is when you only hear one side of the story, or only believe what you see. Most times, parents can understand if the child is making up things, so they definitely need to be heard. You may want to decide based on your experience, instinct as well as the narrative presented to you. Yes, if I was to summarize my methods of disciplining my kids, I would call myself the person who say I will switch off the TV at the count of 3, and I actually do it. But just some days, when your child needs you to be flexible with your rules and statements, do that! Some days they are way to interested in doing something – let them! Even though I’m a parent to twin children, of the same gender, always getting them the same thing is just y idea of being fair, and not really actually being fair. Being fair means everyone gets what they want, but not necessarily the same things. So, if you have a boy and a girl set of siblings or twins, and one wants a cooking play set while the other wants a doctor play set, you cannot buy two of the same things. Your idea of fair would be to buy them both a play set each, of their choice. Children can get stubborn angry and really aggressive if their demands are not always met. Their tantrums and temper may prevent you from making a suitable decision, or you may even be in a situation where a new decision cannot take place. It is crucial that you explain them the consequences of their actions or choices. This can open up a window of opportunity for making them change their opinion, and take something from the choices of what have been offered to them. There will always be times when the siblings are OK with whatever arrangement they have made for themselves, but the parent thinks that ‘no, This has to be fair’. While most days it does make sense, some days, choose your sanity over the aspect of being fair. With my twins, they always get stuck with the color of their outfits. I buy same outfits that are different colors of the same design. One of the kids is very opinionated in what color he wants to wear and would always pick his favorite. The other one could never wear his siblings color. We tried to change that for them, but we eventually realized that the other baby didn’t care what color he wore. So if them both are fine with the arrangement, then our interference for just and fair play is just not required! So even though your intentions are amazing, you would actually mess up the peace and tranquility in the sibling kingdom. Instead of relying on your ideas of being fair, rely on the cues of your children of what they consider to be fair. More so, being fair to the kids, may not always mean being fair to yourself! So, just sometimes, take a chill pill and let things slide while you make your best efforts to present to your children pretty much of what they wanted to have. If you like this article, do Share it ahead! Indeed we need to first descide ourselves what bring fair means and then review our actions. I loved the point that stated to be a flexible parent. Amazing and beautiful post. Very useful and beneficial tips to be flexible and balanced parents. Being fair is so crucial for the mommies. Great thoughts. Agree with you It’s not easy to be a fair parent all the time. I like the idea of listening and understanding kids different choices and should not be or over power by our choices. Its so difficult for parents to decide on what exactly being fair means. You have described it so well sighting proper examples.